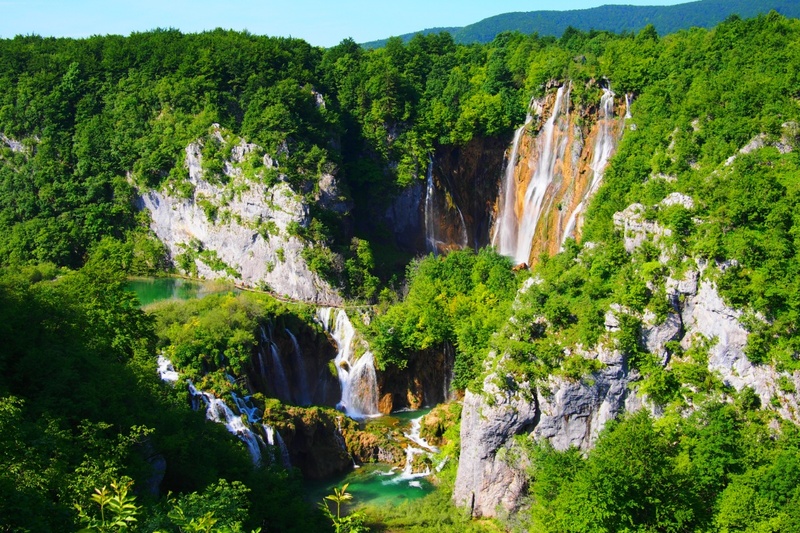 Plitvice Lakes National Park (Plitvička jezera) covers almost 300 square kilometers of protected wilderness and is located roughly halfway between the northern capital Zagreb and coastal Zadar on the western corner. The park’s shining jewel is a lush valley of sixteen inter-connected crystalline terraced lakes, which tumble into a series of cascading waterfalls, with the highest at 78 metres. The lakes actually only constitute 1% of the park’s total surface area but what a stunning 1% it is! The crystal clear turquoise water is so translucent you can see straight through into the depths below. 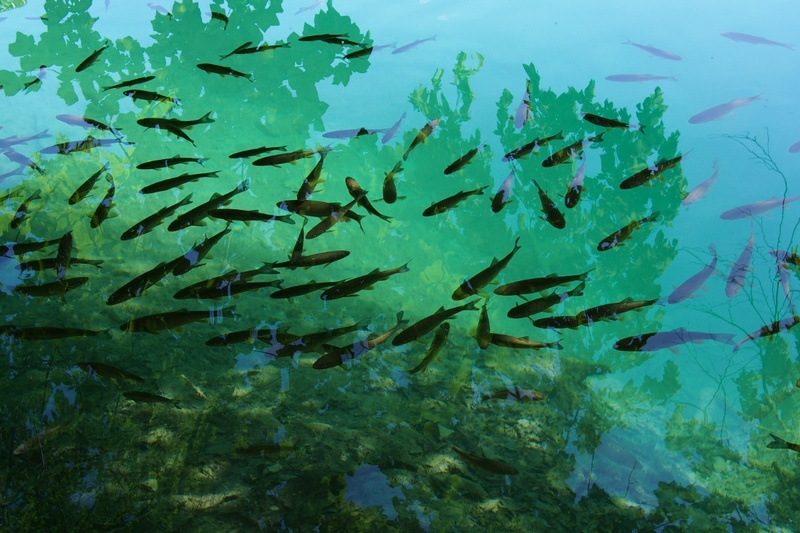 Besides the very tame fish, Plitvice is also home to brown bears, wolves, deer, lynx, wild boar, voles, otters, more than 160 species of birds, 320 types of butterflies, 55 species of orchids and the list goes on and on. Due to the park’s turbulent past and incredibly unique natural and cultural significance, huge emphasis is placed on longevity for conservation and scientific reseach that this UNESCO World Heritage site can offer. The lakes are divided into upper and lower sections which can be walked in various separate loops but the different walks consistently intertwine with each other. 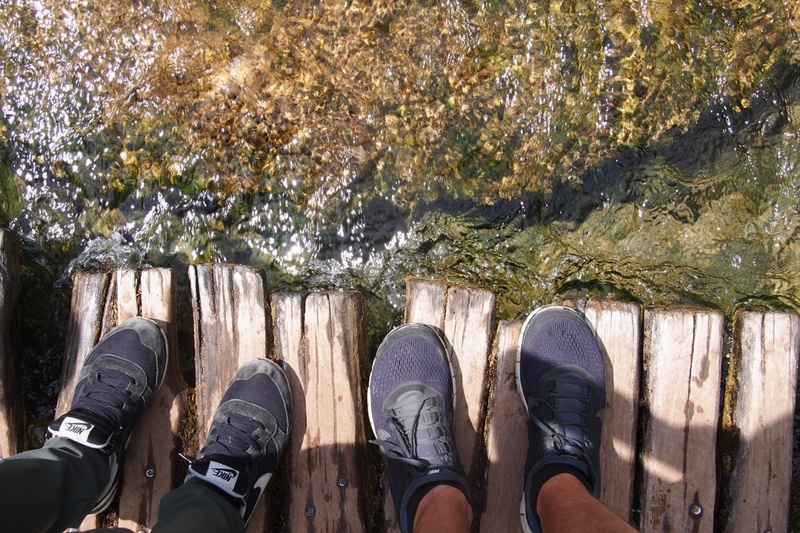 Eighteen kilometres of wooden pathways snake around the edges of the canyons, crossing over the lakes and right on top of the waterfalls themselves. The crisp pure water foams and bubbles right up under your feet as you walk literally along the cascading levels. We followed the crashing might of the water below the narrow wooden struts, until it ebbed and quietened into rocky pools of electric sapphire agaisnt the greenery. Stone steps (watch out they’re slippery!) take you high above the canyon walls, with picture perfect panoramas down into the valley. You can climb right down to the lowest point, right to the base of the highest waterfall. 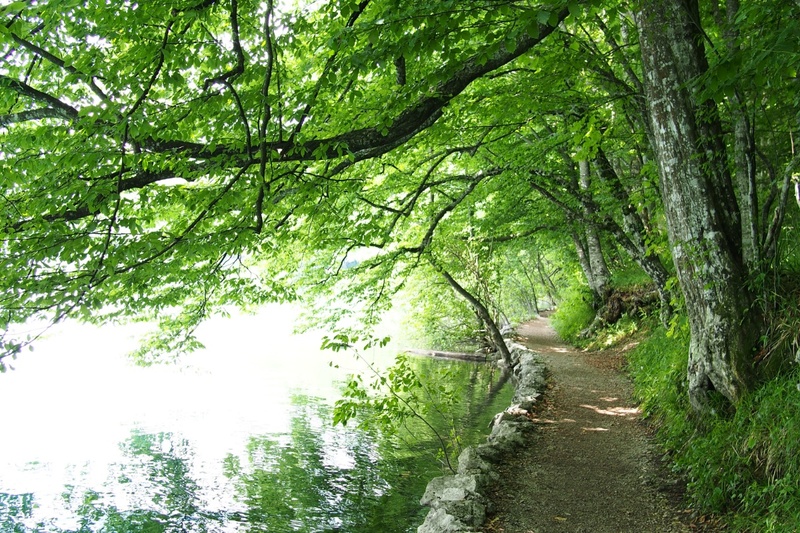 It can take anywhere between three to eight hours to explore the lakes on foot depending on which paths you choose. 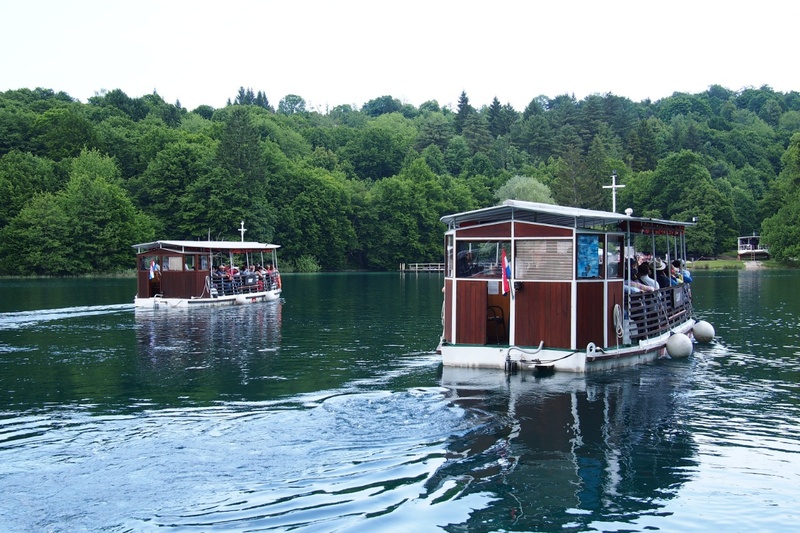 If you get tired you can take advantage of the park’s electric boats and buses, which are included in the ticket price, departing every half an hour across parts of the park. 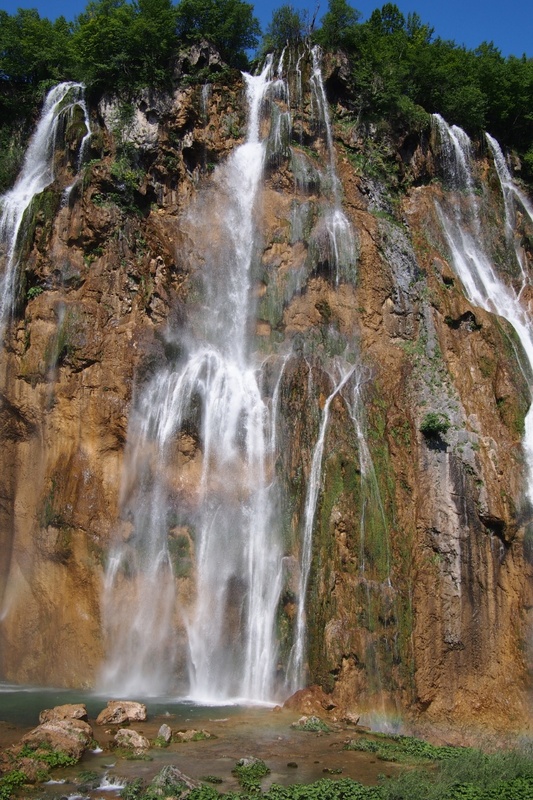 Plitvice gets busy, very very busy. Each year, more than 1.1 million visitors are recorded. Despite the lush forests that surround it, most of the walkways are in direct sunlight and it gets quite hot. 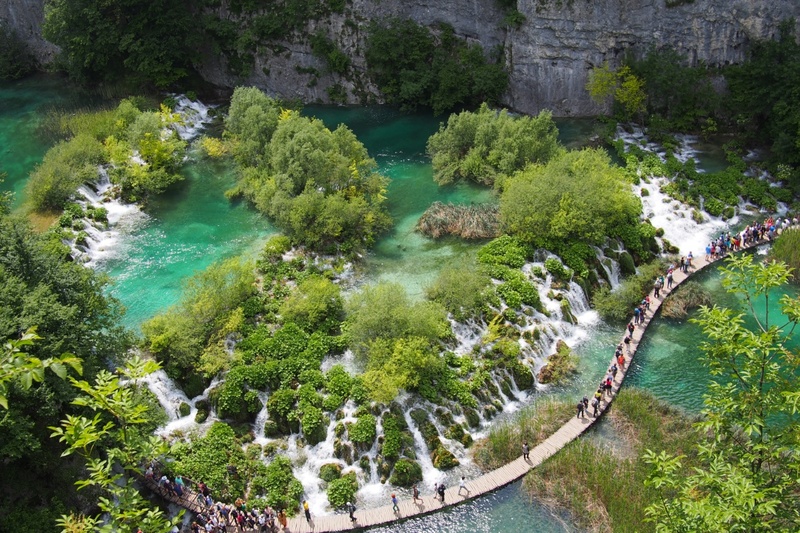 The narrow walkways can get very crowded which diminishes what is an awestruck experience of nature at its purest. Go in the low season and if you’re under your own steam as early as possible. The park opens at 7am which gives you two hours before the tour buses rock up. The park is on most Croatia bus-tour itineraries and there are hundreds of hotels, BnBs and campsites near the park to choose from. We stayed at the very impressive and professional Camping Korana, the biggest and closest campsite to the park. 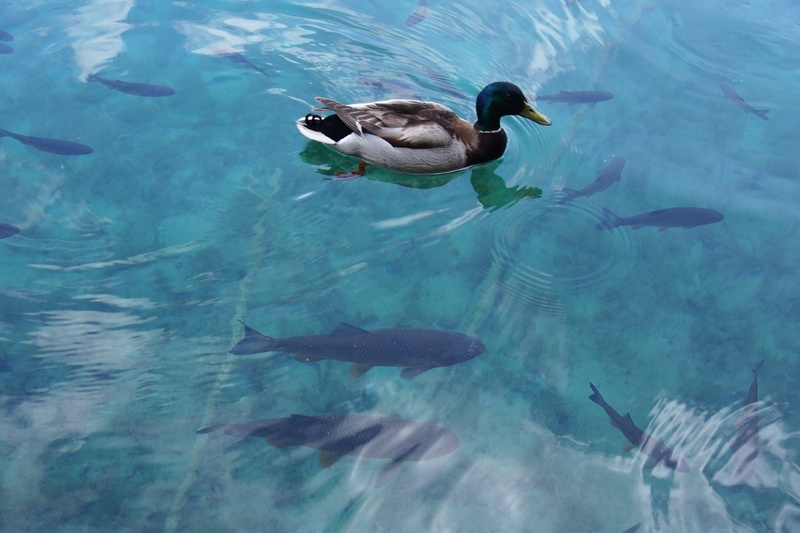 Capable of accommodating 2,500 guests, Camping Korana provides free shuttle buses to and from the lakes. We went on a Monday and the three shuttle buses that were provided were filled to the brim. Interestingly enough on Tuesday morning they were half empty, possibly due to people taking advantage of a long weekend? If you’re camping bring as much food in with you as possible. There are no proper grocery stores due to the national park boundaries, and although the campsites/hotels have small grocery shops these can be overpriced with not much fresh produce. Bring lunch, water and snacks! There is only a couple of spots within the park that have cafés but there are heaps of picnic benches dotted around. You don’t want to limit your lunch view. Also at the main Entrance, Entrance 1, there is a cafe grill serving hot food but the souvenir shop around the corner has drinks, ice cream and snacks for half the price. And so: low season, mid-week, self cater and be an early bird. Got all that? Then long stretches of unhurried photo opportunities of this gorgeous natural wonder will be all yours! great to see no politically correct handrails, I guess Croatia is not a nanny state.